Willie Nelson has teamed up with some of his favorite women for his latest album, To All The Girls, set to be released September 24. The project is a collection of newly-recorded duets between Willie and his dream list of contemporary pop-country female singers. To All The Girls is Willie’s third full-length album of new music to be released in the last 16 months as he continues to celebrate his 80th birthday year. Dolly Parton, Carrie Underwood, Wynonna Judd, Norah Jones and Brandi Carlile are among the 18 female artists featured on the project. 2013 has been a big year for Willie. Besides turning 80 releasing three new albums, he also penned a memoir, Roll Me Up and Smoke Me When I Die – Musings From The Road. 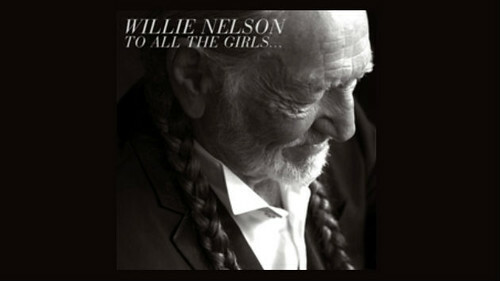 The cover art of To All The Girls features Willie dressed in duds by fashion designer John Varvatos. Willie and his sons, Lukas and Micah, are the faces of the brand’s 2013 campaign. This entry was posted on Sunday, September 24th, 2017 at 11:38 am and is filed under Albums, Duets and collaborations, This Day in Willie Nelson History, You Tube, Vimeo. You can follow any responses to this entry through the RSS 2.0 feed. You can leave a response, or trackback from your own site.